This is the third book in a series (I reviewed My Sister's Wedding and My Summer Vacation in previous entries) and represents something of a break in the narrative. 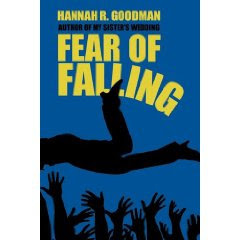 While those two books dealt mostly with Maddie and her family's struggles with older sister Barbara's alcoholism, this book addresses the issues of gay teenagers. Maddie is now back in school, trying to recover from her loss last summer and fighting off panic attacks. As editor for the school paper, she receives an anonymous letter from a student revealing that he is gay and is currently the victim of an abusive partner. Maddie is surprised to find that the school officials not only won't help her respond to this plea, but in fact actively forbid her from taking action. Convinced that something has to be done, Maddie and her friends hatch a plot to raise consciousness about the trials of gay teens. In doing so, Maddie confronts her anxieties and learns to take a brave jump forward. Of the three books in this series, this third one does the best job with storytelling, creating a challenge that helps Maddie become a better person in the end. I still find Goodman's treatment of her younger characters a bit rough, but at least they are telling the story this time. There was a lack of logic to the actions and emotions expressed that rang true for me, giving a level of authenticity to this installment which helped me believe that kids might actually do these things. In the end, this story does not actually turn over any major new leaves about gay teens, but it would make a good discussion piece for a YA reading group.